Refrigerator Capacity: 14.8 cu. ft.
Freezer Capacity: 7.3 cu. ft.
It’s the most popular room in the house, now it just might be the smartest, too! LG SmartThinQ® appliances take innovative smart home technology to new heights, changing the way you run your home and your life! Get ready for a truly connected kitchen with cool features that are not only fun to use, they maximize the efficiency and convenience of your LG appliances—and let you control it all in the palm of your hand. Allows you to keep track of items in your refrigerator and freezer, so you can be alerted when they are near their use-by dates, generate grocery lists, and link to related recipes. Features recipes from the Food Channel, searchable by ingredient, course, cuisine, total time required, and the food in your refrigerator (if entered in the Food Manager). Automatically makes grocery lists from chosen recipes. 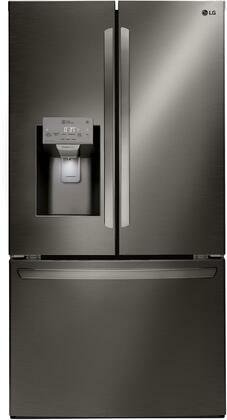 Allows you to diagnose and troubleshoot problems with your refrigerator. Allows you to set various options on the refrigerator and in the app. Connect your LG refrigerator with Google Assistant and/or Alexa for even more convenience. Get an alert when kids forget to lose the door. 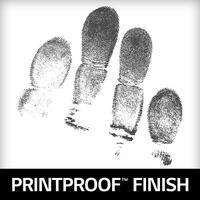 Fingerprint and smudge resistant finish easily wipes clean with a soft, dry cloth, so the only lasting impression is your impeccable taste. At last, the kitchen you can’t wait to show off is the kitchen that handles real-life in style. 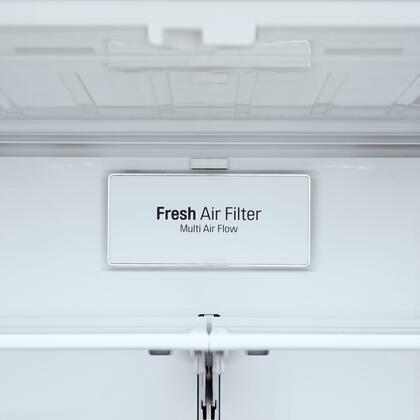 From making extra ice for tonight’s dinner party while you’re at work to adjusting temperatures with simple voice commands, LG SmartThinQ® refrigerators will change the way you think – and the way you live. Use the LG SmartThinQ® app to control key features from anywhere. Or, use the voice-activated features of Google Assistant or Amazon Alexa. 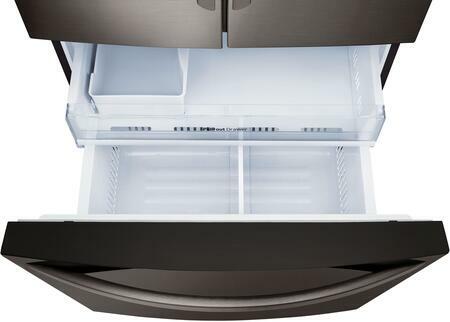 Ice makers are great, but not if it means you can’t fit all of your food in the fridge. 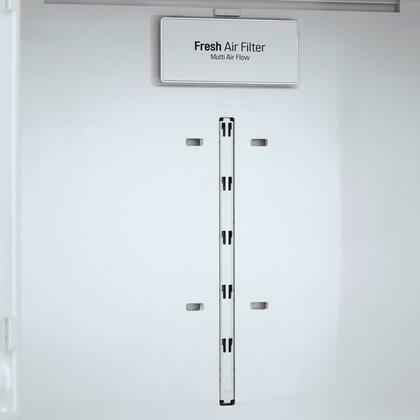 The Slim SpacePlus® Ice System provides the most shelf space and allows even more space for door bins. 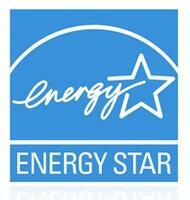 Enjoy new ways to control your home with LG smart appliances. 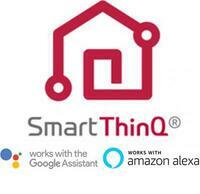 LG Smart ThinQ works with Google Assistant and Amazon Alexa, making it easy to control your LG appliances with your voice. Now you can have all of the things you love about stainless, without the need for special cleaners or constant attention. LG’s PrintProof™ fingerprint and smudge resistant finish easily wipes clean with a soft, dry cloth for a distinctive kitchen that handles real-life in style. 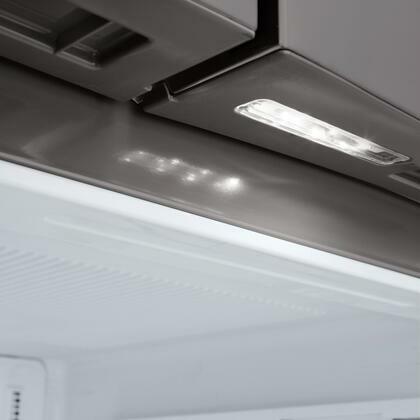 Enjoy a built-in look with the counter depth feature of the refrigerator. Thanks to its shallower depth, it can stand flush with your countertop for a sleek look. 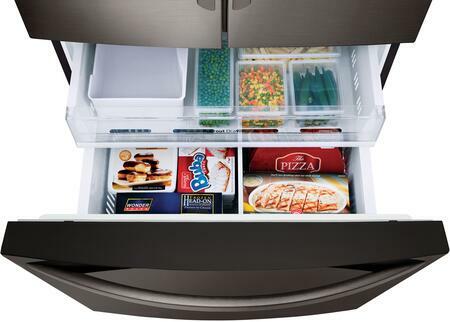 Ice makers are great, but not if it means you can`t fit all of your food in the fridge. 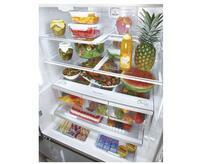 The Slim SpacePlus® Ice System provides more shelf space and allows even more space for door bins. The SmartDiagnosis™ feature helps the service center diagnose problems over the phone, or with a simple app on your smart phone, helping you minimize costly, inconvenient service calls. 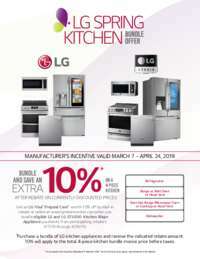 Get 10% off by mail-in rebate or online at www.lgrebatecenter.com when you bundle eligible LG and LG Studio Kitchen Major Appliance purchases. Depth with Door at 90 Degrees: 43.5"
Combined rebates and coupons from AppliancesConnection.com made this LG refrigerator too good to refuse. With all the features, it's a bargain at twice the price! I was having some trouble finding refrigerator with a filtered water dispenser that didn't break up the clean lines of our kitchen. 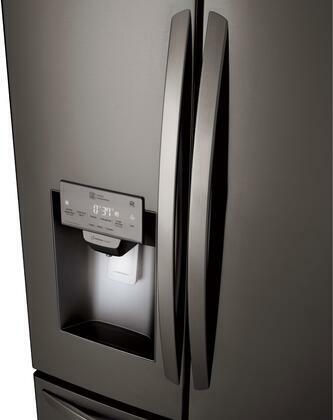 This LG fridge with an internal dispenser is the best of both worlds! 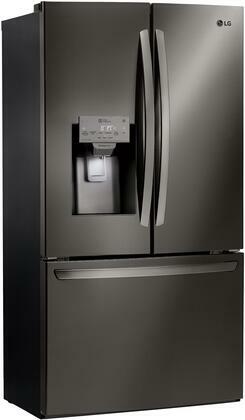 I am in love with the French Door design of my new LG refrigerator! We can fit so much on the shelves and even customize them to accommodate more! 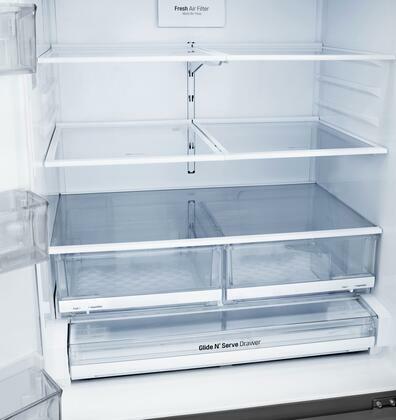 My wife and I like to prepare several meals for the week in advance so when we saw the huge storage capacity in this LG refrigerator, we were intrigued. Paired with huge savings on AppliancesConnection.com, we are very satisfied with our purchase! 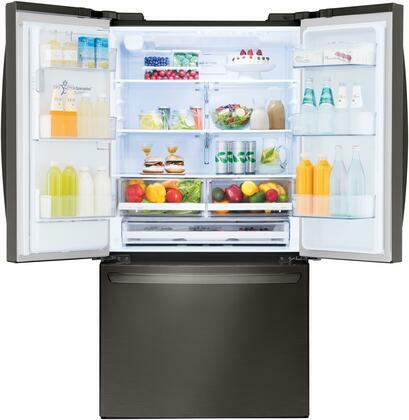 The understated exterior of this LG refrigerator belies its abundant capacity. Over the holidays, I was able to store an entire turducken in there and not have to shift around my usual stuff all that much. 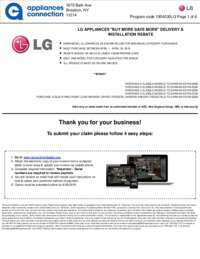 I'd had my eye on the LG refrigerator for some time. I decided to hold off for a bit because AppliancesConnection.com periodically has great package deals. Lo and behold, one popped up and I was able to get what I wanted and a matching dishwasher for a great price. Can't wait for them to arrive. 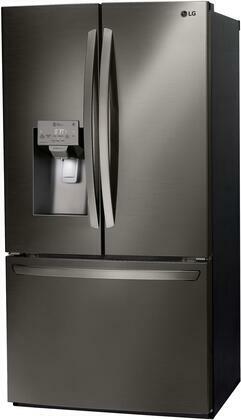 My new LG refrigerator is so convenient and keeps my food extremely cold. 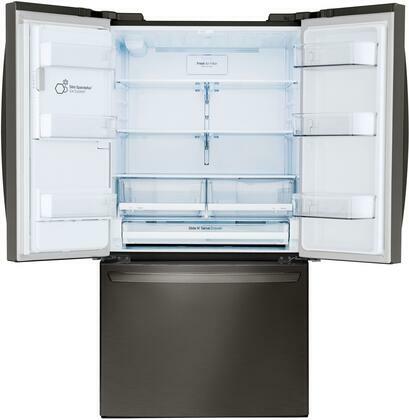 Also, the French Door design looks so fancy but we got a great deal on AppliancesConnection.com! Making lunches and dinners for my family ahead of time is much easier with the huge amount of storage space in my new LG Freestanding refrigerator. Being able to store all of these meals is super convenient! Offered to help replace a friend's older model refrigerator and they insisted that French Door designs were the most desirable. We both agreed that the price we found on AppliancesConnection.com was a steal! He loves it! This model has a great temperature control. I love it.